To conduct research aimed at understanding native plant and animal patterns and interactions in human modified landscapes with a focus on agricultural and urban landscapes, and to produce high quality research of national and international standing. Worldwide, human induced landscape change is one of the greatest threats to biodiversity. Modification and intensification of land-uses presents an on-going threat to remaining biodiversity. Studies of biodiversity conservation in agricultural and urbanised landscapes invariably focus on remnants of native habitat. 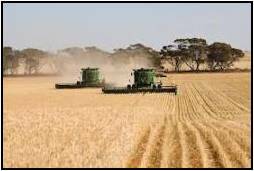 However agricultural and urbanised landscapes often contain a mosaic of native and non-farmland land-uses and habitats (e.g. crops, orchards, paddock trees, roadside vegetation, small reserves and farm gardens) which can often provide conditions for particular native species to persist, or even thrive. This SRA recognises the conservation value of entire landscapes, including its agricultural components, where the need to account for the costs and benefits (in conservation and production terms) of all land-use types is critical to future management. Situated at Australia's first environmentally friendly university campus, the research team works at the coalface of some of the country's most pressing environmental problems and in a landscape highly modified for agriculture, forming a natural focus and context for their expertise. Via collaborations with its international partners, the research team also engage in projects that extend to other terrestrial, aquatic and marine contexts which are also experiencing the impacts of human-induced change. The SRA comprises of an experienced team of terrestrial ecologists (10) who have been recognized as leaders in the field of environmental science. They collaborate with partners both nationally and internationally to address biodiversity loss and work with practitioners to develop conservation and restoration strategies and action plans. With established networks encompassing community groups such as Landcare, non-governmental organizations, councils and state and federal agencies, the SRA provides informed advice on policy and planning initiatives. This SRA, which has traditionally been an area of strength for the Institute, was formalised in 2014 and incorporates the former Ecosystem Services SRA. Since 2007, researchers have led several large Commonwealth funded ARC projects, and worked on collaborative projects with numerous state agencies, in New South Wales and Victoria and, over the past three years, have completed a number of major and local community projects. A three-year ARC Discovery project "Predicting the delivery of ecosystem services in agricultural landscapes" began in 2014 led by Prof Gary Luck. Worldwide, human induced landscape change is one of the greatest threats to biodiversity. Although ecosystems and species possess some resilience to change, the speed and intensity of ongoing human modifications to the earth's natural components are placing significant stress on their ability to persist and survive. Global climate change places an even greater urgency upon efforts to better understand and conserve biodiversity and the ecosystem functions that it sustains. Research towards conserving biodiversity in agricultural landscapes has almost always focussed on remnants of native vegetation. Indeed, such 'islands' in the farming seascape are often critical to conserving species. 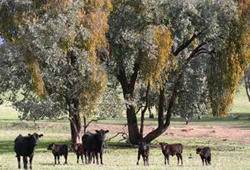 However we recognise that farms can also provide important resources for native fauna - from crops to associated non-farmland habitats such as dams, gardens and orchards. 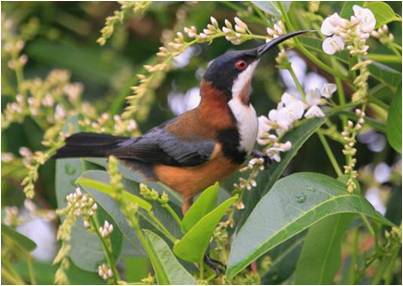 In turn, biodiversity can also provide important benefits or services to production e.g. pollination for crops or control of insect pests. Increase connectivity between isolated populations. Researchers were able to identify how almond plantations contribute to the conservation of the threatened Regent Parrot and other native bird species; quantify the costs and benefits of bird use in almond orchards; and developed management recommendations for the almond industry to maximise conservation gains while minimising impacts on production. The model developed from the "Designing landscapes to deliver eco-system services to agriculture" ARC Discovery project complete in 2012 will greatly enhance the flow of services from nature to agriculture by linking land-use options with service availability. This will improve economic returns to local communities and agricultural industries, and promote protection of native species by recognising their contribution to agriculture. A four year ARC Future Fellowship (Prof Gary Luck), which examined the relationships between biodiversity conservation and ecosystem services was completed in 2014. The work developed and tested new methods to identify spatial priorities for protecting ecosystem services and biodiversity, and examined how animals contribute to ecosystem-service provision in agricultural landscapes. It has led to a new ARC Discovery project with the expected major outcomes a greater capacity for agriculturalists to maximise ecosystem benefits and increase economic returns, and improved biodiversity conservation through recognition of its contribution to agriculture. 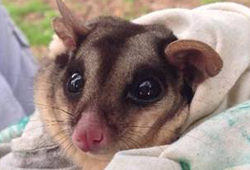 Findings from a project which examined the effects of urban encroachment on the use of hollow bearing trees by squirrel gliders have been used to inform conservation management approaches in the Albury area, and in urbanised landscapes elsewhere. Diet of alpine herbivores in the Australian mainland. Robinson, W. (2015-) Ongoing collaborative project with Dr Ken Green (NSW NPWS) and Dr Naomi Davis (Melbourne University). Life-history correlates of nest predation in island and continental passerines. Massaro, M., Watson, D.M. & Lawrence, C. (2014-16) Ongoing research on life history evolution and ecological responses to invasive predators. Influence of land-use history on biodiversity conditions in Travelling Stock Routes and Reserves. Spooner, P. (2015 - ) ongoing research in collaboration with NSW Land and Property Information, Dr Terry Kass and Mr Iain Marshall. Big Tree Competition. Spooner, P., Laird, S. & Neidra, S. (NSW Nature Conservation Trust) (2015) Community engagement project to support Slopes to Summit and NSW Great Eastern Ranges Initiative. NSW OEH, $10 000. Regeneration by native trees and shrubs following land use change. Lunt, I. (2015-2016) Research in selected Victorian landscapes, PhD students Erika Cross and Joey Walters-Nevett. Stelling, F., Allan, C., & Thwaites, R. (2017). Nature strikes back or nature heals? Can perceptions of regrowth in a post-agricultural landscape in South-eastern Australia be used in management interventions for biodiversity outcomes? Landscape and Urban Planning, 158, 202-210. Luck, G.W. (2016) 'Service Providing Units' in Potschin, M., Haines-Young, R., Fish, R. and Turner, R.K. (eds) Routledge Handbook of Ecosystem Services. Routledge, London and New York. Beliakov, G., Geschke, A., James, S., Nimmo, D.G. (2016). Linear Optimization for Ecological Indices Based on Aggregation Functions. In Carvalso, J.P., Lesot, M., Kaymak, U., Viera, S. et al (Editors) Information Processing and Management of Uncertainty in Knowledge-Based Systems. Proceedings, Part II I of the 16th International Conference, IPMU 2016, Eindhoven, The Netherlands, June 20 - 24, 2016, Volume 611, of the Communications in Computer and Information Science series published by Springer. Saunders, M., Cunningham, S. & Rader, R. (2016) Chapter 3. Agricultural Beescapes in Australian Native Bees, AgGuide series published by NSW Department of Primary Industries. Spooner, P.G. (2015) Minor rural road networks: values, challenges, and opportunities for biodiversity conservation. Nature Conservation 11, 129-142. Saunders, M. (2105) Costs vs benefits of birds and insects in agricultural landscapes. Case study: Victorian apple orchards.6th Biodiversity Across the Borders Conference 2015, Federation University, Ballarat, June 12. Watson, D.M. (2015) Wildlife restoration: applying lessons learned from revegetation to safeguard native animal populations. 6th Biodiversity Across the Borders Conference 2015, Federation University, Ballarat, June 12. Watson, S.J., Luck, G.W., Spooner, P.G. & Watson, D.M. (2014). Deconstructing human-induced land-cover change: incorporating the interacting effects of frequency, sequence, timespan and magnitude of changes on biota. Frontiers in Ecology and Environment 12, 241-249. Evaluated for Faculty of 1000 top papers in biology. Varsani, A., Porzig, E.L., Jennings, S., Kraberger, S., Frakas, K., Julian,L., Massaro, M., Ballard, G., Ainley, D.G. (2014) Identification of an avian polyomavirus associated with Adélie penguins (Pygoscelis adeliae). Journal of General Virology. Watson, S.J., Watson, D.M., Luck, G.W., Spooner, P.G. (2014) Effects of landscape composition and connectivity on the distribution of an endangered parrot in agricultural landscapes. Landscape Ecology 29, 1249–1259. Luck, G.W., Carter, A. & Smallbone, L. (2013). Changes in bird functional diversity across multiple land uses: interpretations of functional redundancy depend on functional group identity. PLoS One. 8(5): e63671. On Friday, November 4, 2016, the Woolshed Thurgoona Landcare Group held a spotlighting night at the Hume Dam Wall Reserve picnic area with Drs Wayne Robinson and Alison Matthews. On the 7th of September, ILWS members Prof. David and Dr Maggie Watson attended the National Rewilding Forum, organized by the National Parks Association of NSW. Forty-five people attended the forum, delegates coming from a wide range of universities, agencies and non-governmental organizations. The full proceedings from the forum are available to ILWS members and will be fascinating reading for everyone interested in safeguarding the long-term future of Australian wildlife. Dr Dale Nimmo delivered the John Paul Memorial Lecture at the Innovations in Landscape Conservation Forum held on Tuesday, May 17 at CSU/GOTAFE Wangaratta. Organised by the North East CMA in conjunction with Trust for Nature, DELWP and ILWS, the day which attracted over 90 people, included talks on deer management issues, fish ecology in inland rivers by Dr Lee Baumgarnter and the management of carp threats. Drs Lee Baumgartner and Wayne Robinson ran a community wildlife trapping night with the Thurgoona Woolshed Landcare group around Corry Wood, Thurgoona, on Friday, November 13. The night attrached about 30 community members, including lots of children. Dr Wayne Robinson spent a number of days in August with the Barkindji Maraura Elders Environment Team who are undertaking environmental research in the lower Darling region, NSW as part of a collaborative three year project funded by the Indigenous Advancement Strategy and La Trobe University. Wayne assisted with the project's design. A record number of over 550 people attended the conference on Friday, June 12. The program featured five ILWS speakers. A/Prof Ian Lunt delivered the keynote address. "From science to inspiration: 10 tips to promote ecological literacy and successful conservation in our communities." Prof Dave M Watson "Wildlife restoration: applying lessons learned from revegetation to safeguard native animal populations". Dr Peter Spooner "Biodiversity interactions in mallee almond crops." Dr Manu Saunders "Costs vs benefits of birds and insects in agricultural landscapes. 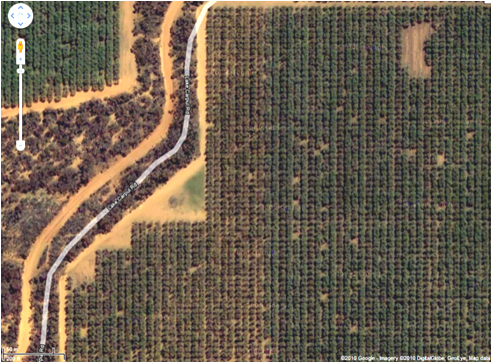 Case study: Victorian apple orchards." Adjunct Dr Simon Watson "Conserving biodiversity in human landscapes - patterns in time and space." CSU has been part of multiple bids to establish a new Cooperative Research Centre to develop and trial innovative decision and on-ground tools to safeguard Australasian biodiversity. Professor David Watson has been a key player in this process. Although unsuccessful, the organisations involved in this bid remain committed to this vision, formalised as the FAUNA Research Alliance. ILWS has made a commitment to become an institutional partner of this alliance. Kosciuszko to Corowa, and south of Henty, Holbrook and Tumbarumba. The response to the competition was very strong nation-wide as indicated by the hits on its Flickr page, which had over 14,000 views in four days after the winners were announced. The winner of the Big Paddock tree (submitted by Anne Hicks, Holbrook) was a River red gum (Eucalyptus camaldulensis) with a girth 950cm circumference at 1.3m above ground. "S2S is about increasing connectivity across the landscape for biodiversity which is strongly linked to the aims of the Institute's Biodiversity Conservation SRA," says Dr Peter Spooner who is on the S2S Working Group. Dr Peter Spooner spoke on ABC Riverina breakfast with Anne Delaney at 7.30am on 6/5/2015 and at 9.35am on 7/5/2015 with Tim Holt of ABC Radio Bega about the success of the Big Tree competition. Single-crop farming is leaving wildlife with no room to turn Dr Manu Saunders' recent research shows a possible link between monoculture landscapes and fewer wild pollinators in her article in The Conversation appearing on 14 May 2015. Nature how do I value thee? Let me count the ways, and Lost on a floral desert are two articles by ILWS ecologist's Dr Manu Suanders and Prof Gary Luck published in Wildlife Australia Magazine in March 2015.
most popular ecological blogs in Australia. Dr Manu Saunders hosts a blog site titled "Ecology is not a dirty word", which gains much attention in the ecological community online. The effects of feral animals on bird diversity around waterholes in the Northern Territory. Zsofia (Sophie) Palfi The role of novel human disturbances on ant-plant interactions in roadside environments. Rebecca Peisley Predicting the delivery of ecosystems services in agricultural landscapes. Liz Znidersic The detectability of cryptic birds (Lewin's rail, Cocos Buff-banded rail and other rail species) to assist with conservation /management options. Dr Alexandra Knight The case for Sloanes Froglet: Generating ecological knowledge with the intent to benefit biodiversity. Dr Buddi Poudel The effects of pastoralism on the behaviour of the Himalayan marmot (Marmota himalayana) in high altitude rangelands in Nepal. Prof Gary Luck. Collaborations with researchers at the University of British Columbia in Vancouver and other centres to develop new projects and co-author journal articles on the topics of ecosystem services and functional traits. Dr Peter Spooner. Ongoing participation in the Infra Eco Network Europe (IENE), a collaborative researcher and manager forum to develop solutions to mitigate the impacts of roads on the environment. Prof Dave Watson. Collaboration on the ecology of forest mistletoes with Prof Robert Matthiason at Northern Arizona University and Prof David Shaw, Head of the Forest Health Laboratory at Oregon State University - coordinator of the "Parasitic plants of forest trees" working group at IUFRO. Dr Maggie Watson is working in collaborative with Prof Bill Sutherland (University of Cambridge) and Prof Amos Bouskila (Ben Gurion University, Israel) on a 'Conservation Evidence' project. Canterbury) and Brazil (Federal University of Santa Catarina) on food security.